Sophomores Debora Mulokozi and Jarissa Sabal were awarded scholarships to attend Notre Dame International’s study abroad program in Angers, France, during the 2017-18 academic year. Mulokozi is a Hesburgh-Yusko scholar majoring in international economics and French; a native from Tanzania, she intends to use her French skills in Francophone Africa to help with education policies with street children. Sabal is majoring in French, and film, television and theater; by going to Angers, she hopes to develop a wider worldview for use in her writing, and to follow her passion of the French language. Sabal also participated in the inaugural London Global Gateway seminar for incoming freshman students in 2015. The FitzGerald scholarship was established in 2002 to honor two dedicated and beloved members of the Notre Dame community, Dr. John James FitzGerald, distinguished professor of philosophy and dean at Notre Dame, and his wife Patricia LaSalle FitzGerald, librarian at Notre Dame. Together, they served as directors of Notre Dame’s program in Angers, France (also called SUNDEF – Stage Universitaire de Notre Dame en France), from 1978 to 1980. Both Francophiles with an immense love for international studies, their love and enthusiasm for the Angers program made the years spent abroad for the students of SUNDEF XIII and SUNDEF XIV very special. 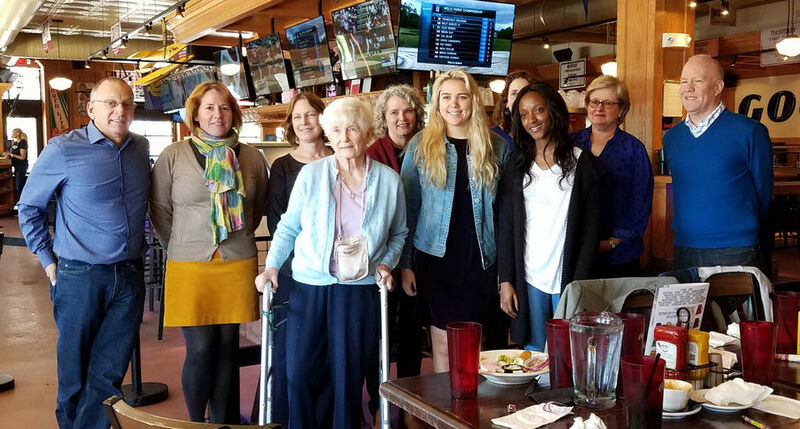 James DiMaria and Kirk Ogren, founders of the John J. and Patricia L. FitzGerald Scholarship and alumni of the study abroad program in Angers, France, organized a luncheon on May 6 to honor the 2017-18 scholarship awardees. Members of Angers program alumni attended the event, as did Jane Doering, who with her late husband Professor Bernard Doering helped found the Angers program in 1965. The Doerings were on-site directors in Angers, mentoring a total of six different cohorts of Notre Dame students. The FitzGerald scholarship is awarded each year to students planning to study in Angers. To date, it has helped a total of 26 students. Originally published by Christiane Buessard at international.nd.edu on May 17, 2017.